*Updated April 2* Spring is officially here and for DIY investor’s it’s already off to a great start. To begin with, there was a bullish sign heading into April as two online brokerages, Desjardins Online Brokerage and HSBC InvestDirect, elected to extend offers that were scheduled to expire at the end of March. In fact, of the four deals set to expire at the end of March, two have already been extended and at least one more, from BMO InvestorLine, is on the way to replace the deal that officially expires on April 1st (it is still live at the time of publication). The only offer that is officially expired at the time of publication is from Virtual Brokers, however there is a strong likelihood that they will not be out of the promotions section for very long. So, at the kick off to April, there are still two cash back offers on the board, and if the referral promotions are included in there, technically there are five offers on the deals board that DIY investors could use to get a cash bonus upon getting into a new account. The category with the most offers, by far, is transfer fee coverage offers. 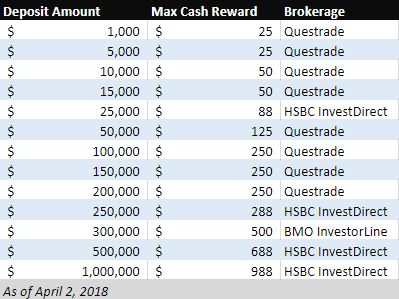 As we observed last month, Qtrade Investor lowered the required minimum for investors to qualify from $25,000 to $15,000 and as such, are one of the most competitive offers of the group. Investors looking for a trading commission-related offer – such as commission free trades or a discounted commission rate, have seven offers to choose from (not including referral offers) so there’s a healthy mix of bank-owned or independent brokerages to choose from in this category. As always, if there are any other offers that we’ve not listed that might be of interest to other readers, feel free to leave a comment below. At the time of publication, Virtual Brokers’ discounted commission promotion offer expired. HSBC InvestDirect, which is normally somewhat selective in timing offers through the year, elected to extend their cash-back promotion making it and BMO InvestorLine the only two cash-back offers available to all investors. Also extended was Desjardins Online Brokerage’s popular 1% commission credit offer. The timing coincides with the launch of their new logo as well – a positive sign they’re positioning for interesting activities to come. There were no new offers to report at the time of publication, however we’re on the lookout for possible offers coming soon from BMO InvestorLine. C) $300,000 A) $200 or 20 commission-free equity trades. B) $400 or 40 commission-free equity trades. C) $750 or 75 commission-free equity trades. Cash back will be deposited the week of Nov. 12, 2018.